Don’t forget to enter my book giveaway! Only five more days to enter! Gathering 160 tales from 80 tribal groups to offer a rich and lively panorama of the Native American mythic heritage. 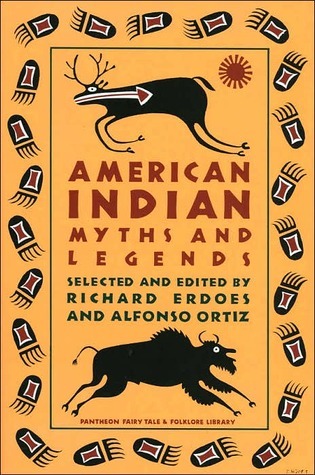 This was a good and broad overview of Native American mythology and stories. Despite having grown up in the west, I wasn’t actually familiar with many Native American stories. I was primarily reading this book to do research for an upcoming project. The stories were interesting and well-told. Most were pretty short, which made it a nice before-bed book as I could read two or three then go to sleep. The one thing I didn’t like was that some of the stories featured more modern elements in them…I was looking for something with more traditional stories. Most were more traditional, but a few were dated from the nineteenth and twentieth centuries, after the Native American wars with the white man and their subsequent internment on reservations. Some of these stories were pretty dirty. I wasn’t bothered by that, just surprised, especially as some reviewers for the book had mentioned reading them to their kids as bedtime stories. I think this was a great introduction to some of the symbolism and archetypal story constructions that exist within the Native American story-telling tradition. I found the forwards at the beginning of each “section” very informative as they explained things like the creation myth, stories about trickster gods, and conceptions of death. The back also had a section with the names of Native American tribes in the US, their relative location, and some history about them. As always when I read myths or legends, it’s interesting how many elements are shared. Creation of everything in the world, creation of language, a great flood, a deathly underworld and more.